Restoring the natural hormone level in your body isn't that difficult to do. The foundation of the process begins with an understanding of human biochemistry, particularly human steroid hormones. You heard right – steroids. That word conjures up negative thoughts of illegal or dangerous drugs. In fact, steroid hormones are critical to our body's health. We cannot live without them. They are produced in the adrenal glands and ovaries or testes. As they decline, symptoms appear which are myriad and frequently mental-emotional, so much so that a woman may feel that she needs psychiatric care. The usual procedure at this point is to prescribe anti-depressant drugs, and in some cases, hospitalization if symptoms persist. The possibility of severely reduced levels of natural hormones is rarely considered, and thus, the levels of these hormones are never measured. As we have seen in the overwhelming majority of cases, an infinitely preferable natural solution exists but is lost in the haste to rubberstamp the problem as psychiatric. To restore the human hormone level in your body to previously adequate levels simply requires an understanding of our natural biochemistry and the integral role of steroid hormones to the process. 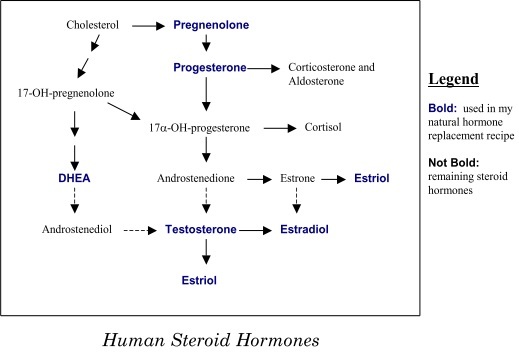 “Human Steroid Hormones” demonstrates how the human steroid hormones are all interrelated. I have shown how they connect to each other. Do you see testosterone in the picture? Did you think it was only a male hormone? It is extremely valuable to a woman's biochemistry as well. I call it the forgotten female hormone. Testosterone is probably the most important hormone of all. In my recipe, if I had to give up all but one hormone in a treatment plan, testosterone would be the one I would keep. It restores vitality, energy, sense of well-being, enthusiasm for life, and libido. It is anabolic, which means it builds tissue. It re-grows bone tissue, muscle tissue, collagen tissue, and probably brain cells as well. It restores the immune system, and alleviates many of the mental-emotional symptoms that women experience as hormone production declines. Testosterone replacement in women is becoming more standard therapy. Obviously this is a positive development provided that the real human testosterone is used, not an alien substitute, such as progestin which is an alien substitute for progesterone. DHEA and pregnenolone are building blocks of both the estrogens and testosterone. DHEA, pregnenolone, natural estrogens, and natural progesterone all do amazing things. Testosterone, in small dosages, does not make you male, but instead makes you more female. You become more alive. Joy is restored to your life. You deal with parenting and/or job-related stress more effectively. You become more self-confident, energetic, and patient. Interpersonal relationships are enhanced and marriages are strengthened. You will experience a “window of wellness” where most, if not all, of your symptoms are gone. This period of wellness may last only a few days at first. We now know that your symptoms are indeed caused by hormonal decline or they would not have gone away for even a short time. This is great! We must now expand the “window of wellness” so that it can exist all of the time. The true scientist behind the natural hormone therapy is Dr. Bernard Rice, a Kansas City endocrinologist, who researched testosterone for many years before entering clinical practice. He came to the practice of medicine with an extraordinary scientific background in human steroid hormones. We have worked together for approximately 25 years. I have heard Dr. Rice's patients describe how his therapy has saved their lives, saved their marriages, and saved their sanity. These are superlative words and phrases coming from discerning, credible women who are not prone to exaggeration. Some women felt that they were being poisoned by traditional replacement drugs. Others simply accepted that feeling bad was an irreversible way of life. The treatment causes your body to respond as though your ovaries secreted these natural hormones into your bloodstream. It is essential to follow a scientific approach to individualized treatment. Revisit the "Symptom Checklist" regularly. The goal is to eliminate the symptoms of hormone decline without causing side effects. It is my hope that this information has contributed to your education on options that are available to you as you age. This book was designed to give you comfort knowing that I understand your symptoms and have treated thousands of women just like you.